Ok so how do you turn the traction control off ?? the bike lifts the front wheel no problem but then the traction control kicks in and lands it for me !! Re: Ok so how do you turn the traction control off ?? Here's the info from the manual. 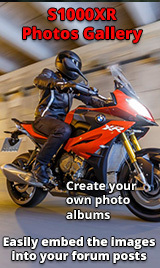 Follow the link it'll take you to BMW select service then riders manuals, select S series then scroll down to find XR.. Your that what this forum lark is all about.